We can design and install boiler packages for all kinds of commercial and industrial premises, ranging from a single boiler through to multiple boilers and rig systems in plant rooms. All our boiler installations are designed to maximise efficiency, optimise performance, reduce running costs and deliver reliable comfort levels. We also provide comprehensive service packages, which help you to ensure your boiler system continues to operate reliably and reduces the risk of more costly breakdowns or repairs. In the event that you do experience a boiler breakdown or reliability issue, our Gas Safe engineers will diagnose and remedy the problem as quickly as possible. If you’re interested in finding out whether your business or organisation could reap the benefits offered by renewable energy systems, you can take advantage of our expert advice and support. We can spend time to understand your needs and requirements, before recommending a solution that could work for you, then designing and installing it in your premises. 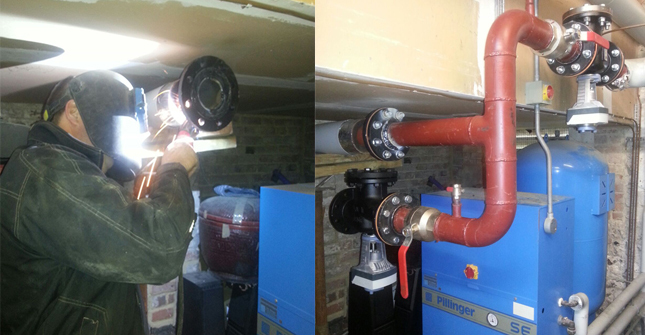 Pipework is our speciality, and we’re never satisfied unless the job we’ve carried out is perfect. We provide a fully managed commercial plumbing and pipework service, from initial design through to professional installation, then ongoing maintenance and repair work. Whether you just want to move a couple of pipes or your new building needs a complete fit-out with plumbing and equipment installed from scratch, our experienced and qualified engineers can help.